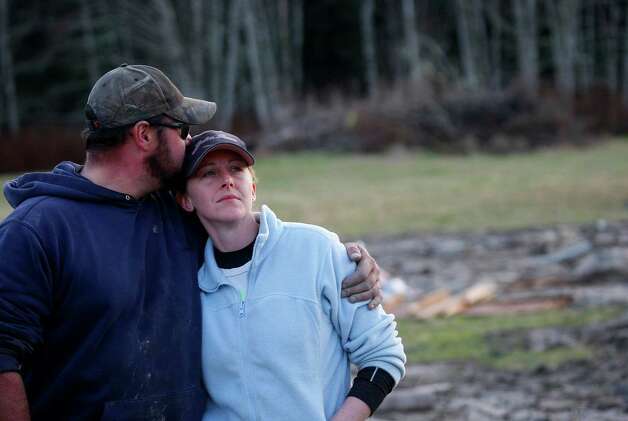 Darrington a week after a mudslide left at least 24 people dead and numerous others missing. The Darrington area, about 55 miles northeast of Seattle, experienced higher-than-normal rainfall, which may have triggered more than a square mile of earth to dislodge and cascade downhill. But other questions remain unanswered. The death toll has continued to rise as workers sift through the rubble that destroyed at least 30 homes. The Seattle Times has uncovered a 1999 report filed with the U.S. Army Corps of Engineers that warned of “the potential for a catastrophic failure” at the site of the landslide. “We’ve known it would happen at some point. We just didn’t know when,” Daniel J. Miller, co-author of the report, told the Times. If this catastrophe was predictable, why are we only hearing of this now, after so many lives have been lost? Ever since September of last year, local and national news has been thick with suspense over the case of 24-year-old Jonathan Ferrell, who was gunned down by a police officer while seeking help from a motor vehicle accident in Charlotte, North Carolina. Was the Oregon Bus Crash Preventable? Failing to learn from past experience: was the Korean tour company’s Oregon bus crash preventable? With a heavy heart, I read about Sunday’s tragic bus crash on Interstate 84 near Pendleton, Oregon, which killed nine people and injured many more, all apparently tourists on a bus tour conducted by a Korean travel company (the Mi Joo Tour and Travel Company). With relatives in the Pendleton, Oregon area, and having litigated bus roll-over cases as a personal injury attorney, I have traveled this section of road many, many times, during both winter and summer. In the summer, under even the best of conditions, the westbound section of Interstate 84, with its treacherous downhill grade and convex curves, is concerning and requires great caution. In the wintertime, it demands ultimate respect, with safe driving often requiring chains and speeds as low as ten (10) or fifteen (15) miles per hour. One will often see professional drivers literally creeping at walking speeds as they drive westbound down I-84’s Deadman’s Pass in the far right-hand lane (the lane farthest from the steep ravines), with hazard lights flashing. On Dec. 24, just after 1 a.m., one person was killed and another injured by gunfire just before last call at Munchbar, located at Kemper Freeman’s Bellevue Square. KING 5 News reported that several altercations led to the shooting. Reports also said several Seattle Seahawks players and reality TV star Aubrey O’Day were among a crowd of hundreds in the Munchbar when the shooting began. Is Cinemark Negligent in Batman Shootings? Monday, July 30: Earlier today, a Colorado court charged James E. Holmes, the 24-year-old gunman who killed 12 moviegoers and left dozens wounded when he opened fire in an Aurora, CO., movie theater during “The Dark Knight Rises,” with 142 criminal counts, including 24 of first-degree murder. Yet questions remain about the liability of Cinemark, the corporation that owns and operates the complex in which the Batman premiere was debuting. Why, for example, weren’t armed guards and/or off-duty police present at the busy showing? Perey Law Group PLLC has vast and successful experience in cases involving inadequate security provided by large national corporations. In fact, one of our cases, Tolenoa v. Denny’s, resulted in the largest verdict of its kind: $46.4 million. When a life ends because of negligence or medical malpractice, the legal rights of the surviving husband, wife, parent, or other family members are commonly referred to as a “wrongful death” lawsuit.